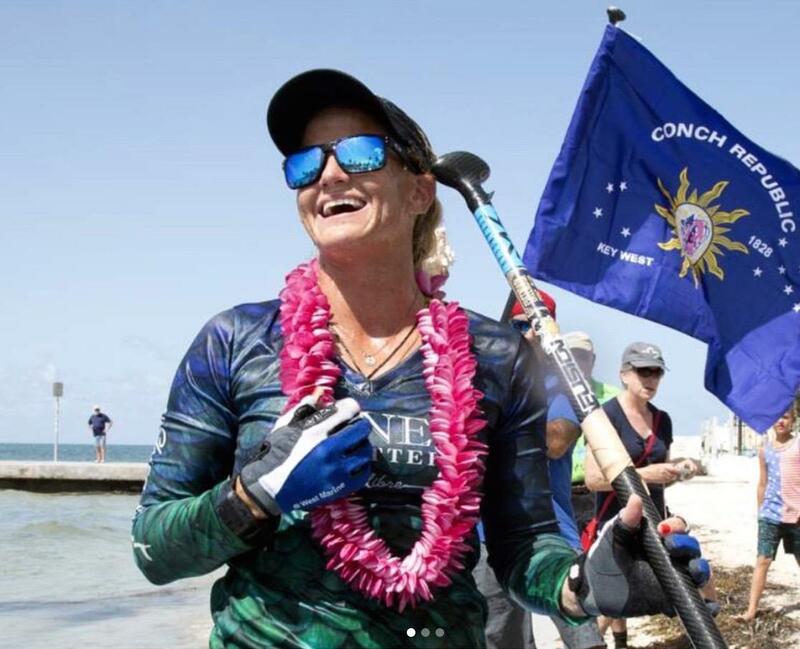 Victoria Burgess of Pompano Beach became the first woman to paddleboard from Havana, Cuba to Key West. Victoria Burgess has long enjoyed testing herself with physical challenges. But on June 27, she did something no other women has ever done before. The Pompano Beach fire inspector paddleboarded the 105 miles from Havana, Cuba to Key West. She overcame four-foot seas, heat, endless winds and exhaustion to complete the trip in about 27 hours. The city of Pompano Beach has now recognized one day each year in honor of her. And she is waiting for the Guiness Book of World Records to review her accomplishment. Burgess said she at times questioned her decision to make the crossing. She had to stay focused at all times in order to keep her board straight and avoid expending extra energy. But as she told Sundial, her training, constant eating and determination helped her finish the trip. Listen to the full interview with Pompano Beach fire inspector and pattleboarder Victoria Burgess. More and more so these days, I'm just really trying to push myself physically and mentally while I'm healthy and still can. So that was kind of like the base inspiration of why I chose to do something like this. You're already a competitive paddleboarder, but I’m wondering about the training that you have to do for a journey like this. What were you doing to physically and mentally prepare? I do race competitively. There's usually short races, mostly like eight miles. I've done a couple of longer crossings that were like 33 miles. But this was about three or four times more than the longest I'd ever done. So I did a lot of research on ultra endurance training and such with bikers and runners because there isn't much for paddlers. I basically took a lot of their different trainings, and I tried to like piece something together that would make sense for me. So that's kind of how I planned it with the longest paddle being 12 hours. I did mostly hour training instead of distance. And then nutritionally it was the same thing. I'm a certified sports nutritionist, so I have a background in that. I practiced a lot of my eating. And I knew if I could keep myself fed and I didn't have any G.I. distress, there was a good chance I'd be able to make it. We originally had a forecast that was supposed to be [winds] five to 10 knots from the southeast, which would have been a little bit of a downwind kind with the wind at my back and side. But it wound up being a straight east wind, which was on my right side. So I remember I saw white caps already right when we started, and all this side chop and a lot of wind. The wind never let up. I had a squall come in from my right side and the current was coming from my left side. So I was pretty much paddling on my left side for 90 percent of the time. We only had one storm that came through and that was at night. And it just kicked up the wind, but there was no lightning or any rain. It was just really hard to see. The moon went away, and it was really really choppy. It was probably about four feet. So throughout the process how did you rest? How did eat? And how did you stop and go to the bathroom? I made sure no matter if I was hungry or not that I ate every hour either a sandwich or pasta. I had a little menu for myself—a couple different kinds of sandwiches, pasta Alfredo. And then every half hour or so and more as we went on, I had snacks like cookies and bananas—quick sugar type of things that kept me propped up. Every hour I went over to the boat. They handed me my food and if it wasn't too rough, I sat down for like a minute or so. And I would just use that time to chew my food and stretch my legs. I think it really helped in the long run. And then as far as it goes with using the bathroom, luckily I was expending a lot of energy. So that didn't happen too often. But I had to go in the water once. And then the rest of the stuff, I was just standing up peeing basically when I was paddling. 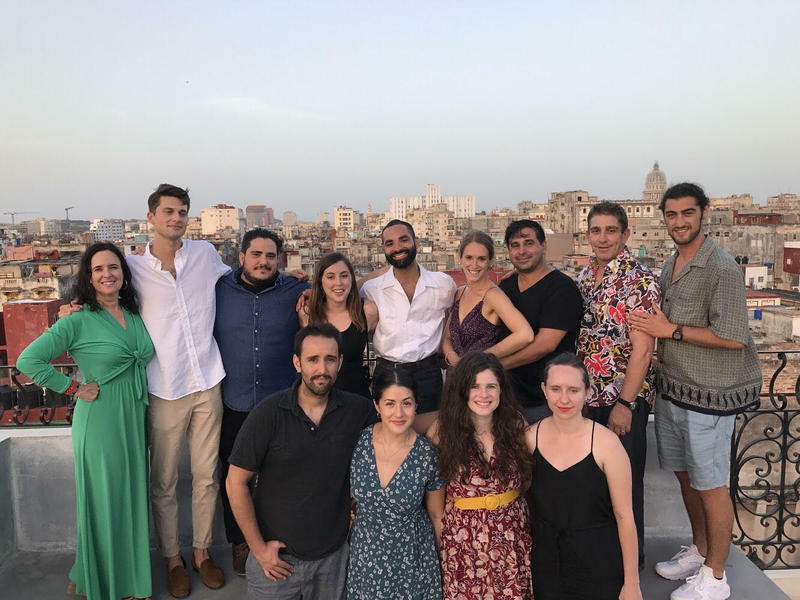 For a lot of first-generation Cuban-Americans, Cuba is almost a myth. Grandparents talk about it at family gatherings, always insisting the music, the beaches and even the sugar was better there.